Avoid the Jolt from a Lightning Bolt! The force and power are so crazy it knocked the guy back a little bit! Living in Southern California, we don’t see a lot of intense thunder and lightning, but you should learn to identify the early signs of an oncoming thunder and lightning storm. Typically you’ll see towering clouds in the shape of a cauliflower, dark sky, distant rumbles of thunder and flashes of lightning. When a storm is on the verge of striking your area, you need to take cover to get out of harm’s way. Do not use a small shed, pavilion or lean-to as shelter; they do not provide enough protection. Stay several feet away from open windows, sinks, toilets, tubs, showers, electric boxes, outlets and appliances during a lightning storm. Lightning bolts can flow through these items, “jump” to you and give you a jolt. Do not use a landline telephone during a storm. Opt for a cellular or cordless phone, which is not connected to the building’s wiring. If your skin starts to tingle or your hair stands up, lightning may be about to strike. Crouch to the ground on the balls of your feet and place your feet close together. Then, place your hands on your knees and lower your head. Try to get as close to the ground as possible without placing your hands or knees on the ground. Avoid seeking shelter under trees, near metal fences, pipes or tall and long objects. If you are boating and cannot get to shore before the storm hits, crouch your body down in the middle of the boat, as low as you can get. Next time you’re in the path of a thunderstorm, you can stay cool knowing Jim Kinmartin taught you everything you need to know about dealing with it ;). Planning is important when it comes to preparing for storms, and that includes having the proper home or business insurance. Contact your broker or me to learn more about insurance solutions for your home, business and life. Stupidity of others is up there on the list of reasons why you should carry home and auto insurance. You might wonder sometimes why you ever carry home and auto insurance. “It can never happen to me” right? Need a review of your home, auto, or renters insurance policies? Call me! I can do that too. Have you ever noticed how many stories there are in the local news about stolen copper? From construction sites to vacant buildings, theft of copper has become a major problem for many communities throughout the country. Skyrocketing metal prices, especially copper, have made what was once a minor issue into a major problem costing over $1 billion/year according to the US Dept of Energy. Copper is recyclable and does not have any identifying marks making it difficult to determine if the metal is actually stolen property. Construction Sites – theft of copper plumbing, wiring, generators and materials. 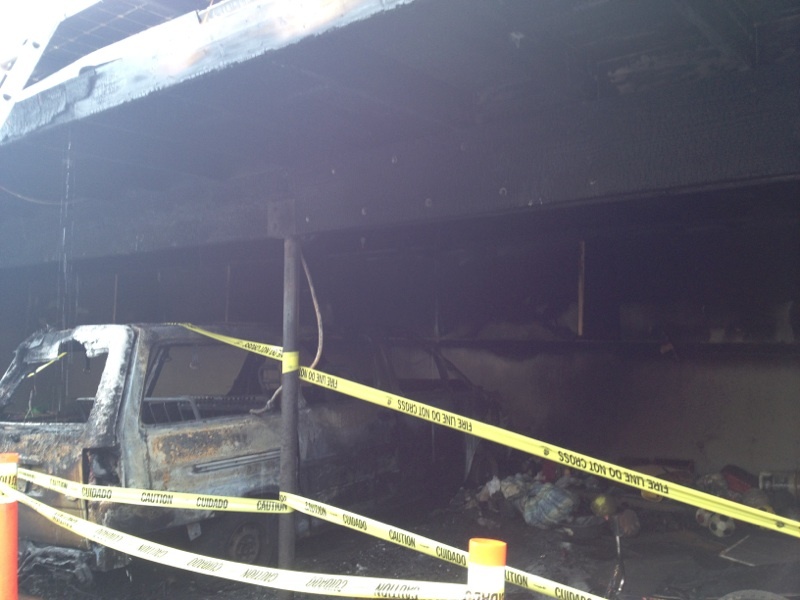 Vacant Buildings – theft of copper plumbing, wiring, air conditioners. Communications Towers – theft of copper wiring and cables. Electrical Sub-stations – theft of copper grounding bars and cables. Foreclosed Properties – theft of copper plumbing, wires, sprinkler systems, and cooling systems. In addition, the collateral damage done from ripping pipes and wires out of walls far exceeds the actual cost of the copper stolen. 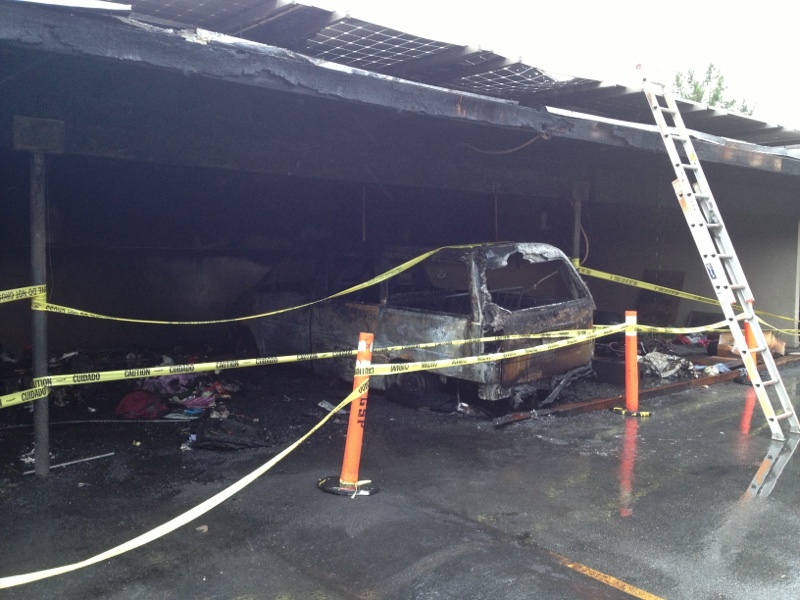 Check out these pictures showing fire damage from a car fire which spread throughout the car port it was parked under. 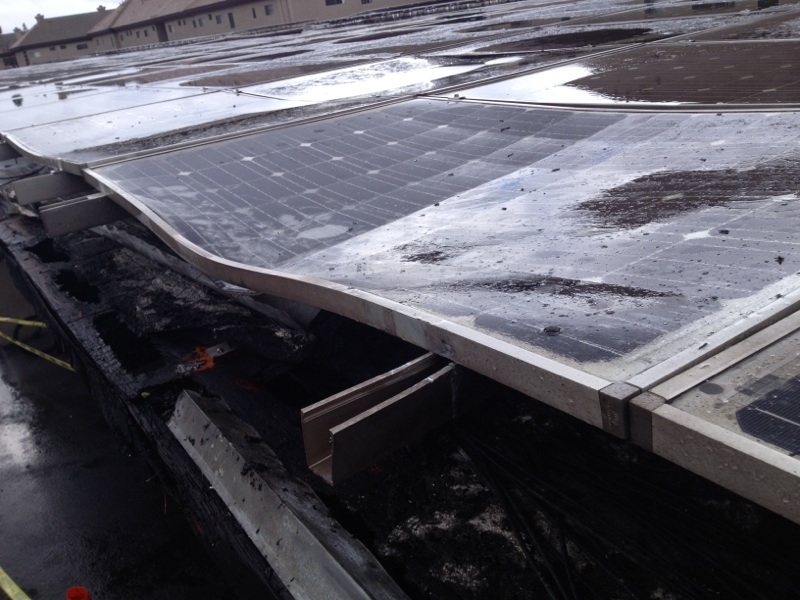 The fire damaged solar panels affixed to the roof which are operated by an insured of mine. Good thing for property insurance. The claim has been submitted with the carrier and we’re working on getting these fixed and back in order. Not only does the property need to be replaced, but the insured will need to be compensated for lost income due to the business interruption.